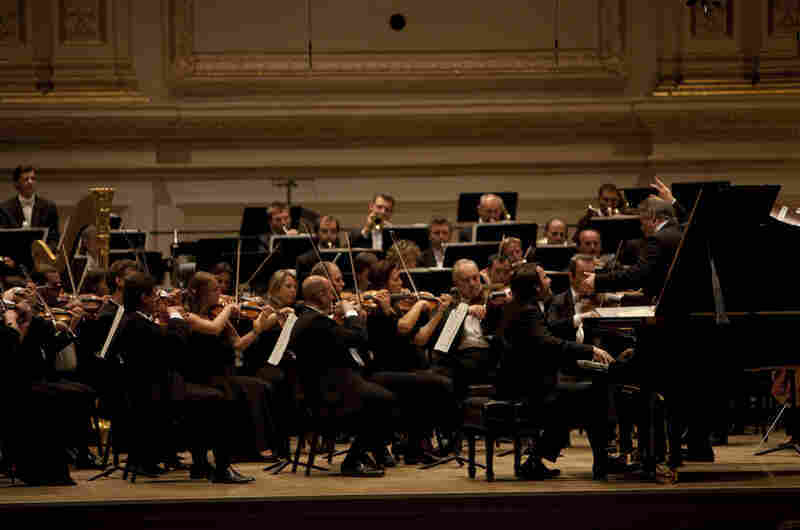 The Mariinsky Orchestra At Carnegie Hall The superb Valery Gergiev led his forces in Tchaikovsky, Shostakovich and Prokofiev-- and help introduce a promising young Russian pianist to American audiences. Pianist Daniil Trifonov performing an encore performance in front of the Mariinsky Orchestra conducted by Valery Gergiev at the Isaac Stern Auditorium at Carnegie Hall on Oct. 11, 2011. All photos: Melanie Burford for NPR. 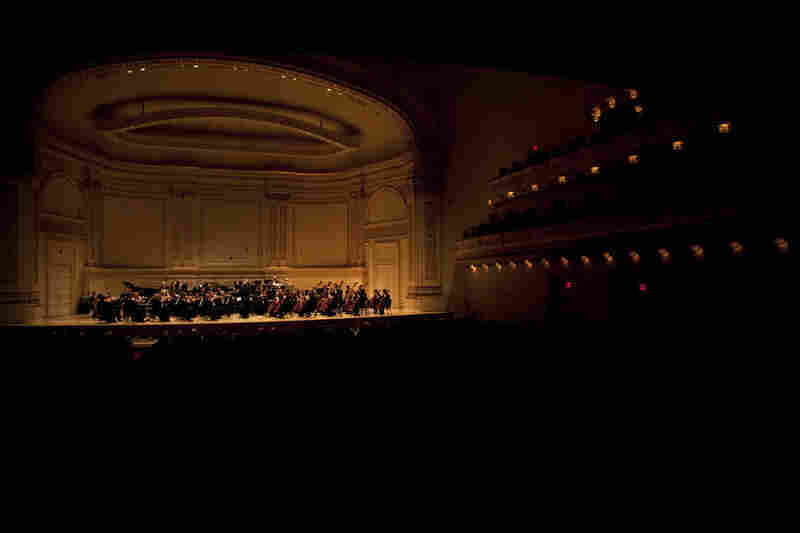 A sold-out audience eagerly awaited this performance by the Mariinsky Orchestra, which was part of a Tchaikovsky-themed series that began Carnegie Hall's 120th anniversary season. This evening marked the 20-year-old Trifonov's debut on Carnegie Hall's main stage; he won the Tchaikovsky Competition this past June. 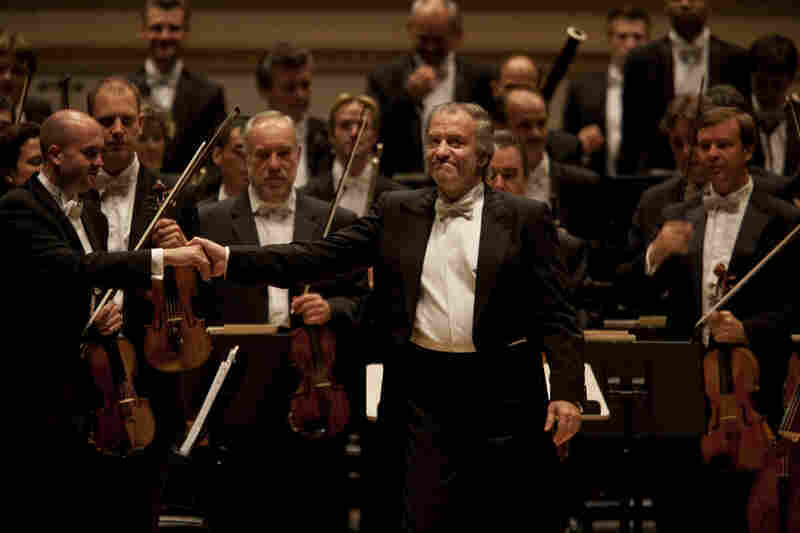 Valery Gergiev acknowledges the audience's cheers. 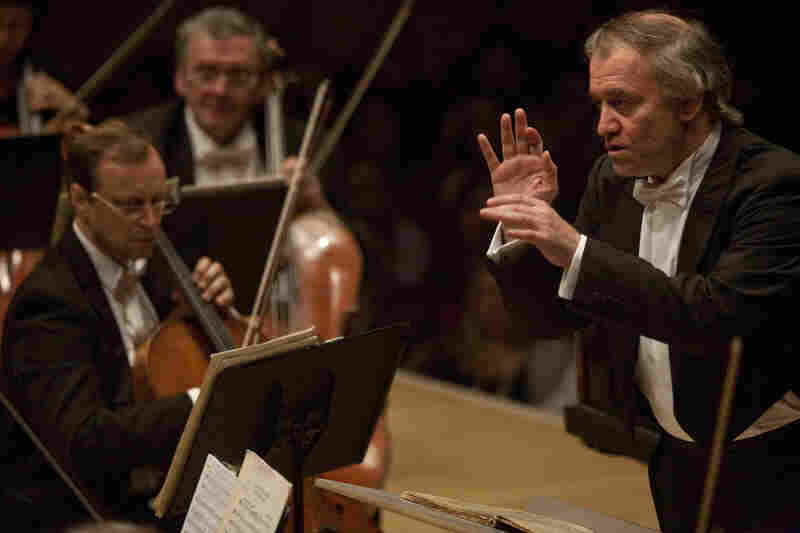 When conductor Valery Gergiev became chairman of the International Tchaikovsky Competition last year he promised to clean house, ridding it of corruption and favoritism while repackaging it for a 21st-century audience. Founded in 1958 and held in Russia every four years, the Tchaikovsky is divided into piano, violin, cello and vocal categories. Van Cliburn, Vladimir Ashkenazy, and Mikhail Pletnev are all past winners, and the judges have included such legends as Sviatoslav Richter, Nadia Boulanger and David Oistrakh. Every entrant must prepare reams of repertoire for a gladiatorial, six-round contest in the Great Hall of the Moscow Conservatoire, a setting music critic Richard Morrison called "scarier than center court at Wimbledon." Despite its historical prestige, the Tchaikovsky had fallen prey in recent years to all sorts of malicious practices that can afflict music competitions. Teachers were voting for their students while voting against others' pupils. Judges were drawn mainly from Moscow, thus putting international competitors at a disadvantage. The balloting process was murky, with accusations of bribes and cartels. Gergiev moved to banish teachers who were voting for their students and brought in a new jury that included several international classical stars: Anne-Sophie Mutter and Yuri Bashmet served on the violin jury; Nelson Freire and Peter Donohoe were among those judging the pianists. The cello jury included Lynn Harrell, Ralph Kirshbaum and Clive Gillinson, the executive and artistic director of Carnegie Hall (and a former London Symphony Orchestra cellist). New management was brought in and the voting was remade using a scoring system modeled on that of the Van Cliburn Competition in Texas. Another of Gergiev's other reforms (also a feature of the Cliburn competition) was to give the Tchaikovsky winners high-profile performing opportunities — for without proper career support, finalists can fade into middling obscurity. So when the conductor leads his Mariinsky Orchestra at Carnegie Hall on October 11, joining him will be 20-year-old pianist Daniil Trifonov, the first-place winner at the Tchaikovsky Competition. 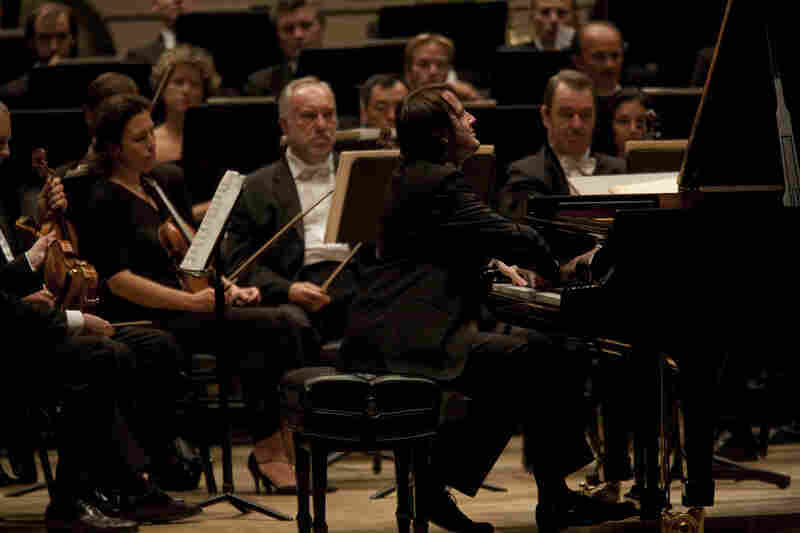 "Daniil Trifonov is playing a very important Tchaikovsky Concerto performance, not only for him but for the reputation of this competition," Gergiev told WQXR's Jeff Spurgeon. "It will be important for him to be on top of his game." Last month, London audiences got a taste of Trifonov's playing when he performed with Gergiev and the London Symphony. Critics had measured praise for the young performer. "He possesses almost boundless potential, but on this evidence is not yet a fully formed player," Martin Kettle wrote in the Guardian. "The charismatic young Russian tore into the Tchaikovsky First Piano Concerto with exhilarating confidence and formidable technique." Born in Nizhny Novgorod in 1991, Trifonov trained at the Gnesin Academy of Music in Moscow before entering the Cleveland Institute of Music in 2009, where he now studies with Sergei Babayan. His win at the Tchaikovsky Competition in July came just weeks after he snagged first place and three special prizes at the 13th Arthur Rubinstein International Piano Master Competition in Tel Aviv, Israel. Trifonov now has more than 100 engagements for this season. Gergiev praised the pianist's ability to play with "a wonderful sonority, a precision, a balance," while adding that he hopes the pianist's competition days are behind him. "I want to move away from sports [analogies] and discussing how a young musician of 19 or 20 years old can simply sustain the pressure of being in six or seven rounds and always playing consistently very high quality," Gergiev said. "It's good news that he can do it. But let's hope for him it will be something of a past." Listeners can assess Trifonov for themselves when we webcast the Mariinsky Orchestra's concert live from Carnegie Hall tonight at 8 p.m. EDT. Please join us for a live webchat during the performance.